Welcome to the Chicago Marist Boys Track and Field site. Practices Monday - Friday from 2:45 pm - 5:00 pm, commence with a brief TEAM meeting at the Bleachers before going to the Track. Thanks. As of April 18, 2019, Banquet Ticket Order(s): Auer (3), Bugos (3), C.Davis (2), Kavanaugh (3), Leonard (5), McNamara (4), Miller (3), Vallie (3). Walsh (3). Order forms available under the link "2019 Track and Field Handouts". Friendly reminder, the bus departs at 2:45 pm on Thursday, April 18, 2019 for Rice Relays. Meet packets are available under the link "2019 Track and Field Handouts". 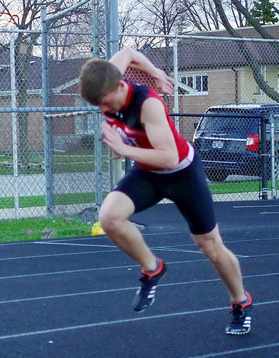 Nick Coccaro WINS 100m dash at Marian Catholic! Michael Coy WINS 200m dash! Josiah Harris finishes SECOND in 110m Hurdles and WINS 300m Hurdles! The athletes listed above have earned a VARSITY letter by scoring a point at the Varsity level, and will be presented with a Varsity letter at the May 26, 2019 Track and Field Banquet at the East Bank Club. Brian Ferguson WINS 400m Dash! Brian Ferguson WINS 400m Dash! Jovan Marsh WINS 100m and 200m dash! Thomas Leonard WINS 1600m run! Jovan Marsh WINS 100m Dash! 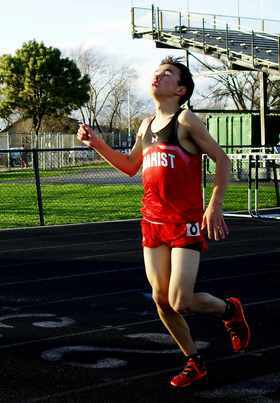 Freshman Luke Bruin anchors Sophomore 4x800m Relay to THIRD place at Oak Lawn Spartan Invitational! Every point scored is vital to the sucess of the TEAM. The winner of a Championship meet has come down to one point on several occassions this season. 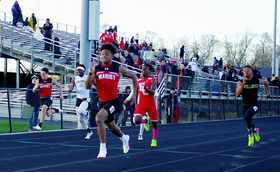 Marist will be hosting the ESCC Track and Field Championships on Wednesday, May 8, 2019, at 1:30 PM. 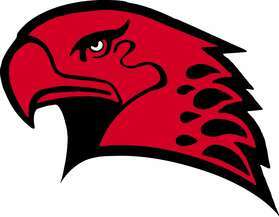 The RedHawks will also be honoring the Seniors (Class of 2019) on Tuesday evening, May 7, 2019, and during the ESCC Track and Field Championships on Wednesday, May 8, 2019. The Marist Coaching Staff and Parents will be hosting a Tailgate party under our TEAM tent during and after the ESCC Track and Field Championships. It will be a special experience for all of the athletes, parents, coaching staff, and guests. We need your help to make this event a success in 2019. 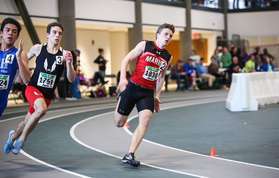 First, if your able to volunteer to work the ESCC Track and Field Championships at the (1) Awards Table, OR (2) Athlete Check-In Table, OR (3) Hurdle Crew, let Coach Gordon know via email at Gordon.Jon@marist.net. Second, if your able to bring any kind of finger food, drinks, paper ware, plastic ware, card tables, let Coach Gordon know via email at Gordon.Jon@marist.net and he will post a list of items being brought to the Tailgate Party on our Team website. Third, Marist would like to thank the following families for contributing $50.00 annually to our 2019 Track and Field Pasta Parties: Anzalone, Auer, Bugos, Burns, Carey, Coccaro, Coy, C. Davis, Derdzinski, Esparza, Ferguson, Geary, Geona, Golden, Harris, A.Johnson, T.Johnson, Kavanaugh, Kerlin, Leonard, McNamara, Miller, Phillips, Quinn, Scott, Vallie, Wagner, and Whittler. Last, we want to remind everyone to ORDER Banquet Ticket(s) prior to April 30, 2019. THANKS. Brian Ferguson WINS 200m dash! Tom Johnson WINS Long Jump and Triple Jump! 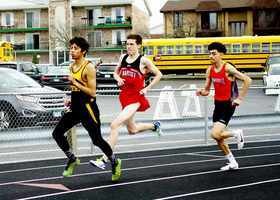 Alexis Arreola BREAKS FIVE MINUTE BARRIER in the 1600m at Benet Academy! 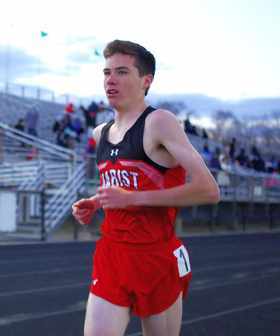 Freshman Jake Phillips and Sophomore Tommy Wagner finish 3rd and 4th in the Sophomore 1600m at Benet Academy! Jovan Marsh BREAKS Sophomore School Record in the 100m Dash! 10.78!! Jovan Marsh WINS 100m and 200m dash! Thomas Leonard finishes SECOND in the 800m! 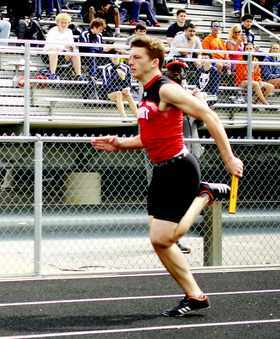 Brian Ferguson anchors 4x100m Relay to SECOND place! 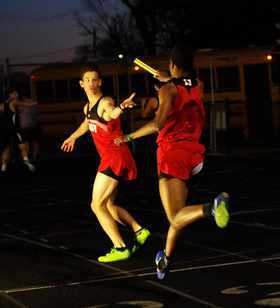 Brian Ferguson anchors 4x100m Relay to a 43.94! Thomas Leonard runs a 2:03.76 800m! 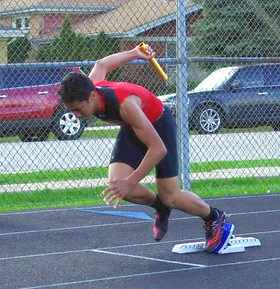 Nick Coccaro anchors Sophomore 4x100m Relay and 4x200m Relay to THIRD place at Amos Alonzo Stagg Invitational! Brian Ferguson finishes SECOND in the 400m! Brian Ferguson finishes SECOND in the 400m dash at Indoor State Championships! Marsh finishes 7th in 60m! Leonard finishes 14th in Illinois in 3200m! 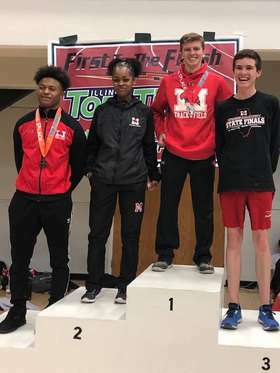 For sheer drama, the 2019 Indoor State Championships (Illinois Prep Top Times), may have topped anything ever seen in the last ten years in Illinois, or maybe ever. 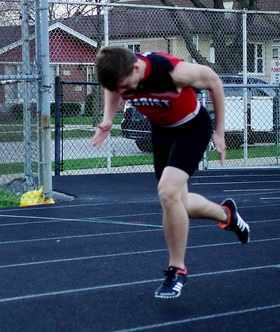 It was a fantastic meet from start to finish. On Saturday, March 23, 2019, Marist Head Coach Jon Gordon, Sprints Coach Mac Melto, Junior Brian Ferguson, Junior Thomas Leonard, and Sophomore Jovan Marsh traveled to Bloomington, Illinois for lunch at Olive Garden at 11:00 am. The Class 3A Indoor State Championships would commence at 3:00 pm. Each Athlete had a different pre-race meal plan, which included Salad and Bread, Chicken and Pasta, or Steak and Pasta. After lunch, the TEAM and Marist Coaching Staff traveled to the Shirek Center Indoor Track & Field Stadium at Illinois Wesleyan University. The energy in the stadium was electric, with a sold-out stadium crowd filled to its capacity, with people standing in the upper deck just to get a glimpse of the meet. The stadium featured a digital screen, showing the results of all the events throughout the meet, and a play-by-play announcer, who gave live commentary on every event that took place. Brian Ferguson, Thomas Leonard, and Jovan Marsh received their race numbers upon arrival, and were placed in a large turf room adjacent to the stadium to put away belongings, and set up a Team Camp. Right next to the turf room, a special gymnasium was used for event check-in, and to run warm-ups. The athletes had access to the stands on the main floor, that were roped off from the Track. Marist had one of the largest cheering sections at the meet, which included Alumni, parents, and friends.A special thanks to everyone for their support. Marist witnessed an incredible Track meet throughout the day, as they waited for the 60m Dash prelims, 60m Dash Finals, 3200m run, the 400m run, and the 200m dash. In the 60m Dash Prelims, Marist Sophomore Jovan Marsh QUALIFIED for the Finals with an outstanding time of 7.12. 18 athletes were eliminated from the Field after the 60m Dash Prelims. In the 60m Dash Finals, Marist Sophomore Jovan Marsh finished in SEVENTH place to reach the MEDAL stand with an outstanding time of 7.12. In a nice ceremony following the 60m Dash Finals, Jovan Marsh received his Medal for finishing in seventh place, then Marsh had to prepare for the 200m dash. 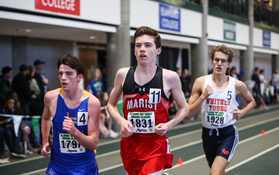 In the 3200m run, Marist Junior Thomas Leonard dropped 14 seconds from the Gene Armer Invitational (9:55) with an outstanding time of 9:41.76. Thomas Leonard finished 14th in Illinois!! 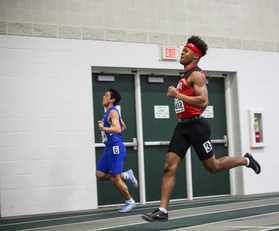 In 2018, Brian Ferguson finished in ninth place in the 400m dash (52.22) at the Indoor State Championships. That changed dramatically in 2019. 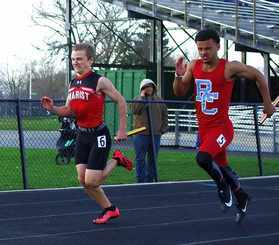 In the 400m dash, Marist Junior Brian Ferguson finished in SECOND place with an outstanding time of 50.87. Brian Ferguson was awarded a MEDAL with a RED RIBBON for finishing in SECOND place at the Indoor State Championships! 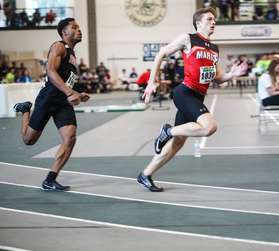 In the 200m dash, Marist Sophomore Jovan Marsh finished 16th in Illinois with an outstanding time of 23.53. Marsh also ran the fastest time by a Sophomore in the meet! After the Indoor State Championships, the RedHawks, Marist Coaching Staff, Marist Alumni, Parents, and Friends traveled to Avanti's in Bloomington to celebrate an outstanding meet. A special thanks to the Leonard Family for treating everyone to a very nice dinner. 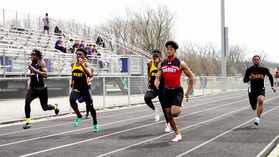 Marist opens the 2019 Outdoor Track and Field season at Amos Alonzo Stagg High School on Saturday, April 6, 2019. Jovan Marsh earns a MEDAL in the 60m Dash! Thomas Leonard finishes 14th in Illinois in the 3200m run!